When it comes to baseball, Eddie Vedder just plain gets it. A day at the park is a treat, a time to kick back, maybe grab a beer and a dog, cheer like crazy for home runs, strikeouts, and slick double plays, and, if you’re lucky, catch a foul ball. Blunderbuss sourpuss Jack White didn’t look too thrilled while taking in a recent stretch of games, though he almost cracked a full smile stopping for a photo with Vedder at Wrigley Field, home of the Chicago Cubs. 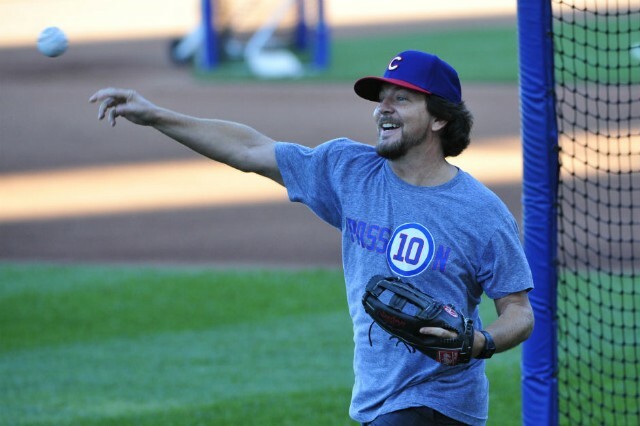 Vedder, a diehard Cubs fan, returned to the stadium last night and lived it up. He got to throw out the first pitch (see below), a very solid effort that was a bit outside but came close to being a strike, unlike 50 Cent’s masturbation-induced abomination. He then went upstairs for the seventh-inning stretch to sing a spirited rendition of “Take Me Out to the Ball Game,” which he’s had the pleasure of doing before at Wrigley (while possibly intoxicated in 2006). The man clearly relished his time at the game, knowing that it’s a respite from the crappier realities outside the stadium, like getting caught up in a stupid controversy over the Israel-Palestine conflict. Heck, being a Cubs fan is hard enough, considering that the team has the longest title drought in the big leagues, having not won the World Series since 1908. If only we could all find such happiness in face of overwhelming despair. Rock on, Eddie.